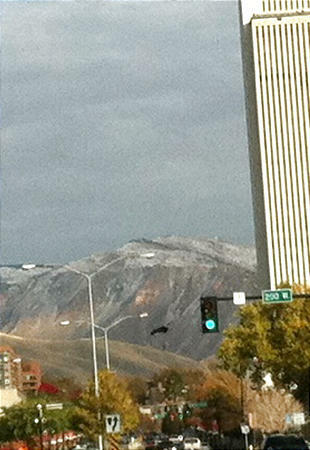 Two men took off in a vehicle after BASE jumping from the top of the LDS Church Office Building Friday afternoon. Police and Church security are looking for two men who carried noticeably large backpacks onto the elevator of the building within a relatively close time period to the alleged jumps around 3:42 p.m., according to Salt Lake City police Lt. Melody Gray. She said officers didn't make it to the scene before the jumpers had sped off in a vehicle that is believed to be a silver SUV. The two reportedly jumped 420 feet from the 26th-floor observation deck of the 28-story building, located at 50 E. North Temple. Witnesses told police the two jumpers were trailed by two parachutes and executed a smooth landing across about six lanes of traffic, in a parking lot across the street.